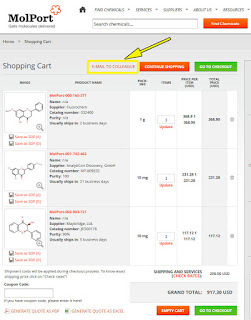 Let’s say you are looking for compounds online. You put together an order using the structure search or list search and now you have the items in your shopping cart. Are you ready to check out, or is something stopping you? 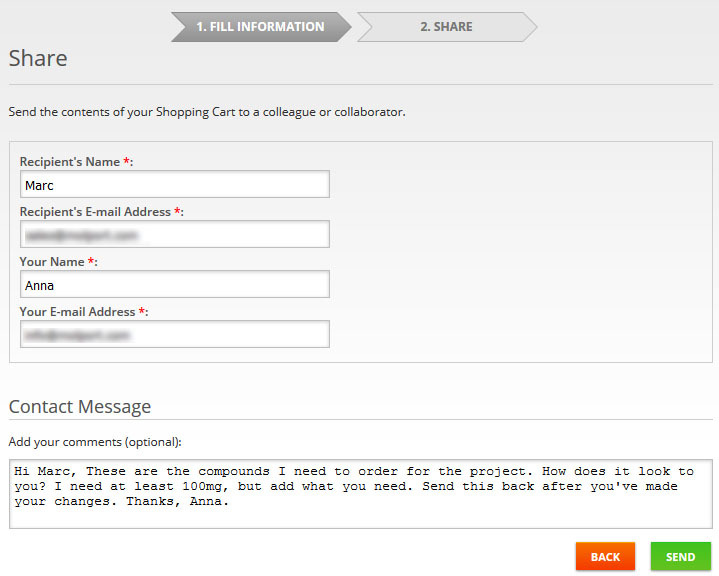 Does your colleague want to add items to your order? Email the shopping cart to them and they can add their items to your shopping cart, and then they can place the combined order. 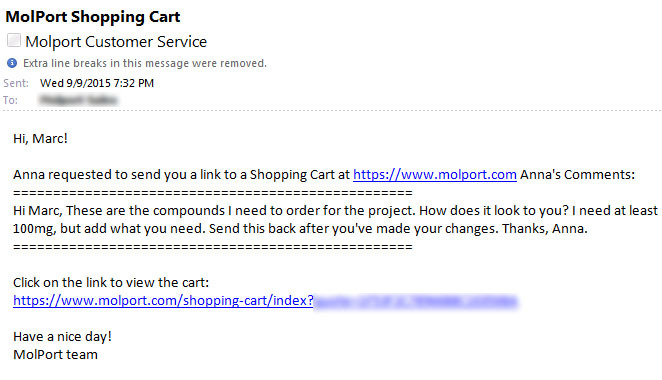 If you need approval from a supervisor, send your shopping cart via email so they can add or remove items. Or, send it to your purchasing officer to complete the order. Why not email it to yourself? You can! That way you can take a break, switch computers, then pick up where you left off. 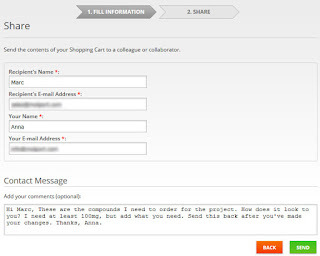 Shopping Cart Sharing was created for collaborative compound ordering. 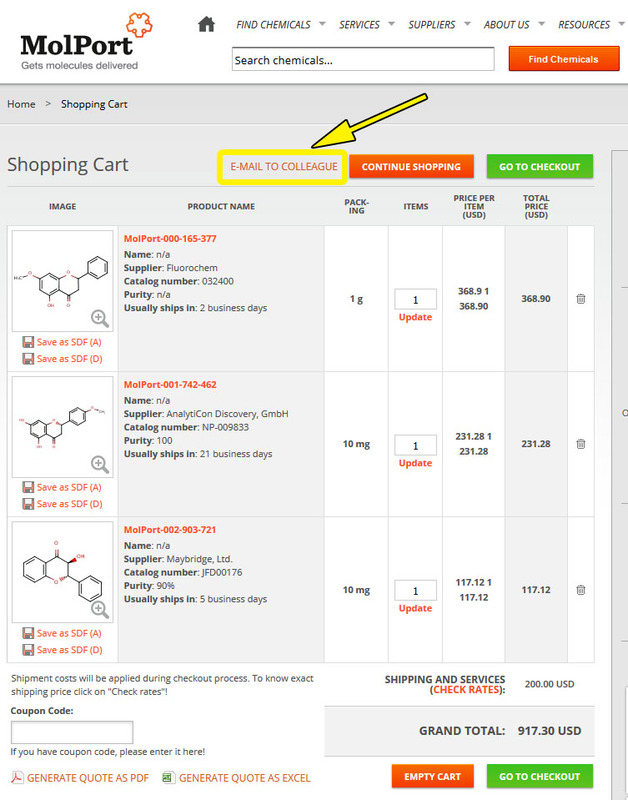 Select compounds and put them in your shopping cart. 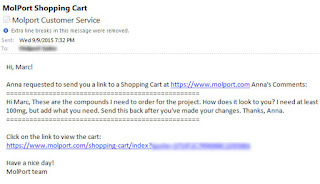 Send your shopping cart of selected compounds to another person with the "E-Mail to Colleague" link shown below. You will enter the colleague’s information and a short message. After sending the email you will get a notification (see lower) and your colleague will get an email. Notice that you still have your shopping cart items. Look at the very top right corner. The items will stay there until you accept to edit a different shopping cart. Your colleague will get an email similar to the one shown below. Follow the link to get to the shopping cart. Make changes and checkout - or send it further! Was this tip helpful? See more announcements on our Forum, and please share any tips and questions you might have.